Many people with chest pain fear a heart attack. However, there are many possible causes of chest pain. Some causes are not dangerous to your health, while other causes are serious and, in some cases, life-threatening. Any organ or tissue in your chest can be the source of pain, including your heart, lungs, esophagus, muscles, ribs, tendons, or nerves. Pain may also spread to the chest from the neck, abdomen, and back. Angina or a heart attack. The most common symptom is chest pain that may feel like tightness, heavy pressure, squeezing, or crushing pain. The pain may spread to the arm, shoulder, jaw, or back. A tear in the wall of the aorta, the large blood vessel that takes blood from the heart to the rest of the body (aortic dissection) causes sudden, severe pain in the chest and upper back. Swelling (inflammation) in the sac that surrounds the heart (pericarditis) causes pain in the center part of the chest. A blood clot in the lung (pulmonary embolism). Collapse of the lung (pneumothorax). Pneumonia causes a sharp chest pain that often gets worse when you take a deep breath or cough. Swelling of the lining around the lung (pleurisy) can cause chest pain that usually feels sharp, and often gets worse when you take a deep breath or cough. Pleurisy is an inflammation of the lining of the lungs and chest (the pleura) that leads to chest pain when you take a breath or cough. Panic attack, which often occurs with fast breathing. Inflammation where the ribs join the breast bone or sternum (costochondritis). Shingles, which causes sharp, tingling pain on one side that stretches from the chest to the back, and may cause a rash. Strain of the muscles and tendons between the ribs. Gallstones cause pain that gets worse after a meal (most often a fatty meal). In children, most chest pain is not caused by the heart. For most causes of chest pain, it is best to check with your health care provider before treating yourself at home. You have sudden crushing, squeezing, tightening, or pressure in your chest. 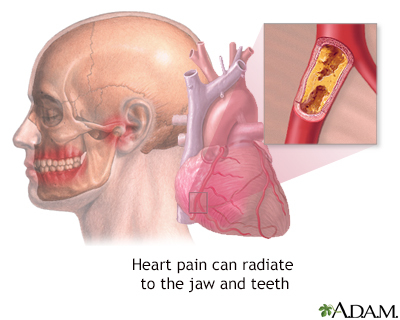 Pain spreads (radiates) to your jaw, left arm, or between your shoulder blades. You have nausea, dizziness, sweating, a racing heart, or shortness of breath. You know you have angina and your chest discomfort is suddenly more intense, brought on by lighter activity, or lasts longer than usual. Your angina symptoms occur while you are at rest. You have sudden, sharp chest pain with shortness of breath, especially after a long trip, a stretch of bedrest (for example, following an operation), or other lack of movement, especially if one leg is swollen or more swollen than the other (this could be a blood clot, part of which has moved to the lungs). You have been diagnosed with a serious condition, such as heart attack or pulmonary embolism. You have a family history of heart disease. You smoke, use cocaine, or are overweight. You have high cholesterol, high blood pressure, or diabetes. You already have heart disease. You have a fever or a cough that produces yellow-green phlegm. You have chest pain that is severe and does not go away. You are having problems swallowing. Chest pain lasts longer than 3 to 5 days. Is the pain between the shoulder blades? Under the breast bone? Does the pain change location? Is it on one side only? Does it begin suddenly? Does the pain occur at the same time each day? Does the pain get better or worse when you walk or change positions? Can you make the pain happen by pressing on a part of your chest? Is the pain getting worse? How long does the pain last? Does the pain go from your chest into your shoulder, arm, neck, jaw, or back? Is the pain worse when you are breathing deeply, coughing, eating, or bending? Is the pain worse when you are exercising? Is it better after you rest? Does it go away completely, or is there just less pain? Is the pain better after you take nitroglycerin medicine? After you eat or take antacids? After you belch? The types of tests that are done depend on the cause of the pain, and what other medical problems or risk factors you have. Bonaca MP, Sabatine MS. Approach to the patient with chest pain. In: Zipes DP, Libby P, Bonow RO, Mann DL, Tomaselli GF, Braunwald E, eds. Braunwald's Heart Disease: A Textbook of Cardiovascular Medicine. 11th ed. Philadelphia, PA: Elsevier; 2019:chap 56. Goldman L. Approach to the patient with possible cardiovascular disease. In: Goldman L, Schafer AI, eds. Goldman-Cecil Medicine. 25th ed. Philadelphia, PA: Elsevier Saunders; 2016:chap 51. O'Gara PT, Kushner FG, Ascheim DD, et al. 2013 ACCF/AHA guideline for the management of ST-elevation myocardial infarction: a report of the American College of Cardiology Foundation/American Heart Association Task Force on Practice Guidelines. J Am Coll Cardiol. 2013;61(4):e78-e140. PMID: 23256914 www.ncbi.nlm.nih.gov/pubmed/23256914. 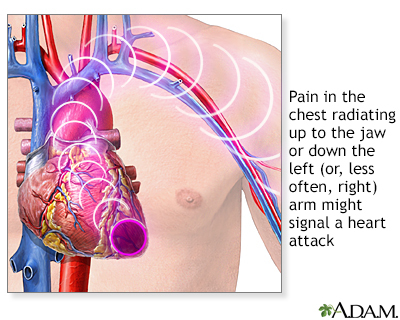 Symptoms of a possible heart attack include chest pain and pain that radiates down the shoulder and arm. Some people (older adults, people with diabetes, and women) may have little or no chest pain. Or, they may experience unusual symptoms (shortness of breath, fatigue, weakness). Women are more likely than men to have symptoms of nausea, vomiting, back or jaw pain, and shortness of breath with chest pain.